I won. I validated. I ordered my winner's shirt. I may have found my modern girl's character conflict (finally) and holy crap, this draft is a mess. 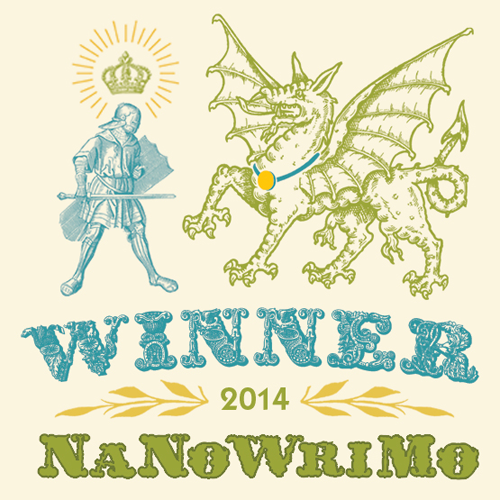 But that's okay, because I squeaked by and won NaNo. 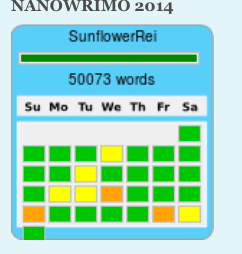 As you can see from the screenshot of the NaNo word count calendar below, this was not an easy NaNo. This yellow boxes were days where I put something down, but didn't hit the daily 1667 words. The orange days were days when I wrote something, but yeah, even less words than the yellow day ones. I've never done a NaNo where I was down to the very last day of the month to get it to 50K. But I did it. Congratulations!! *dumps glitter on your head cause I'm cool like that* Lol! And more yay for modern day Nicole!